Trans fats. They’re the worse type of fat because they pose a double whammy to your heart health – not only do they increase the bad “LDL” (Low Density Lipoprotein” cholesterol, but they also decrease the good “HDL” (High Density Lipoprotein” cholesterol. 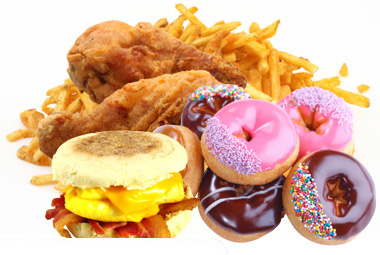 Eating trans fats increases the risk of heart disease. While some foods contain small amounts of naturally occurring trans fats, the real concern is with foods containing “artificial” or “industrially produced” trans fat. The main source of this type of trans fat is partially hydrogenated oils (PHOs) which are oils that have been created during a process called hydrogenation. This process changes the structure of liquid oils into a solid at room temperature. PHOs extend the shelf life of foods and are typically found in commercially baked goods (e.g. pastries, donuts, muffins), deep fried foods, French fries, hard margarine, lard, shortening, frosting, coffee whiteners, some crackers and microwave popcorn. When you see the words “partially hydrogenated oils” in the ingredients list, you know that the food contains trans fats. The ban will come into effect on September 15, 2018. Posted in Fascinating Food Facts, Healthy Eating, News & Trends, Nutrition Labelling, Nutrition Trends | Tagged dietitian, donuts, fast food, French fries, Health Canada, Nutrition Solutions, partially hydrogenated oils, pastries, PHOs, Sue Mah, trans fat ban, trans fats.